All of us want to be happy and we are constantly battling against what makes us unhappy. Indic tradition talks of six enemies of that rob us from our own happiness. 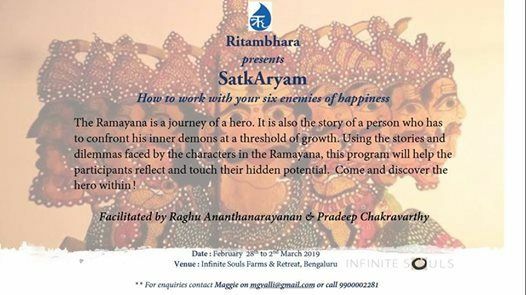 Using the stories and dilemmas faced by the characters in the Ramayana, this program will help the participant recognise what makes them happy/unhappy and what they can do about it for the present and future. 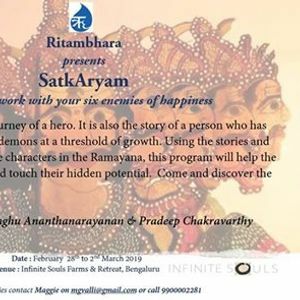 - A religious/philosophical interpretation of the Ramayana or why it is great story or answer to did it really happen or not. - PPT driven lectures that have little practical application. - A list of the six enemies and using stories to work on your own body. - How you can overcome the six enemies of happiness.